CSUN President Dianne F. Harrison joined a panel of national education leaders to discuss how the quality of young Americans’ higher education will make or break our nation’s future in the global economy. 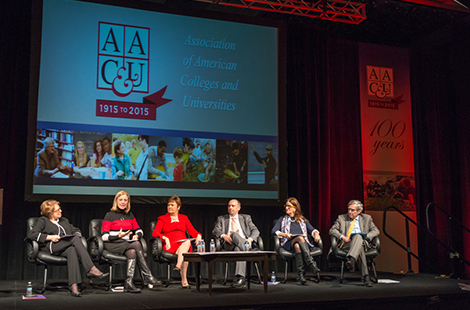 Read more about President Harrison presenting at AAC&U. CSUN’s Bookstein Institute offers taxation services for underserved populations, giving CSUN accounting students a training ground for their future careers. Longtime CSUN accounting professor Rafi Efrat has led this program for years and was recently named the university’s first endowed chair of the institute. Read more about Efrat being named the Bookstein chair. Former Los Angeles County Supervisor Zev Yaroslavsky played a key role in the birth and development of CSUN’s Valley Performing Arts Center, which is now one of the Valley’s landmark cultural institutions. To honor him, the VPAC will name its rehearsal room in his honor. Read more about Zev Yaroslavsky and VPAC. Wed., Feb. 25, 7:30 p.m. Sat., Feb. 28, 7:30 p.m.
Fri., March 6, 8 p.m.
Find out about upcoming events and a series of public meetings in this bi-weekly update. Faculty and staff are invited to join Janis Martin (CATC III) of the Klotz Student Health Center to learn how to recognize addictive behaviors in students and where to send them for help. Faculty and staff members can utilize the special discount code “SFVSC” to see the student production of this Broadway musical. Alumna Eva Longoria: “I Am the Underachiever in My Family"